You’d think that somebody living in Louisiana, the self-proclaimed “‘Sportsman’s Paradise,” would learn through the years that the word “sportsman” didn’t arrive in a dictionary because man was spearing fish or entrapping them with any ancient or modern device. Yet, every time there’s a chance to comment publicly about the ongoing battle between recreational and commercial fishing in the Gulf of Mexico, especially when it comes to red snapper, the Louisiana Restaurant Association lines up squarely against recreational fishermen – the sportsmen living, working and spending money, sometimes in the restaurants that open their doors daily in the Sportsman’s Paradise. The LRA is a powerful organization in Louisiana. It should be. Some of Louisiana’s restaurants are renowned worldwide: Chefs working in them produce culinary masterpieces mostly because of the rich blending that brought together so many unique ethnic cultures in one place – and also because our waters yield such a variety of marine creatures those ethnic groups could adapt for their tables. How odd that, given Louisiana’s freshwater, brackish-water and saltwater bounty, battle lines have been drawn over one species – red snapper. Yet that’s where the lines are drawn today. And it’s why I, someone who has for more than 60 years breathed our humid air, lived through dozens of hurricanes, watched millions of gallons of oil gush from an underwater well, and witnessed the greatest wetlands loss in our nation’s history, despise the more than 20-year fight over this one species, the red snapper. I grew up during the years when recreational and commercial fishermen drew on our bountiful waters with a certain respect for each other. That’s not the case today – not with the recent attacks on the allocation and re-allocation of Gulf of Mexico red snapper. Most years the annual Gulf red snapper quota is 9.12 million pounds, divided 51 percent for commercial anglers and 49 percent for the tens of thousands of recreational anglers living in the five Gulf states. For the last five or six years, the commercials and the LRA decried data that show the recreational take has exceeded its 49 percent. But the question today is “How factual is that data?” The question arises because, by its own admission, National Marine Fisheries Service, as well as the Gulf of Mexico Fishery Management Council, cannot accurately count the recreational take. You don’t have to be a theoretical mathematician to look at the statistical model used to quantify the recreational take to know it’s flawed. For instance, Louisiana’s estimated annual recreational catch is somewhere in the 600,000-pound neighborhood, according to the NMFS, but the model used to produce that number has a wide variation – one that would result in the recreational estimate being as low as 300,000 pounds or closer to 900,000 pounds. You see the problem. This is why recreationals here, especially with more and more red snapper showing up off the Louisiana coast, don’t understand why the LRA’s comments in Gulf Council hearings call for more recreational restrictions, that any increase in recreational catch puts severe limitations on members’ ability to make money in their establishments. In those meetings, I’ve heard on three occasions that as much as 80 percent of the commercial red snapper harvest is shipped out of the country. Those comments, too, leave the recreational side scratching its head over the LRA claim that more fish would help their bottom line and provide fish to Midwest markets. Photo courtesy of John L.H./Yelp.com. There is some truth in the LRA protest: Red snapper is a wonderful fish to eat, but in Louisiana there’s so much more than red snapper, and because there is so much more, we don’t have to worry about the downward spiral of blue crabs closing the doors of diners in Maryland or the collapse of the cod stocks shutting down Northeast fish-n-chips shops. Our state’s epicurean history has drawn on so much more that we don’t need to fight about one species, not when it’s selling in our local fish markets for more than $20 a pound, a price that’s too rich for my blood. Congress is moving forward quickly to revise the federal act that governs our nation’s marine resources. The sportfishing and boating industries, along with recreational saltwater anglers, are stepping up efforts to ensure that their economic, social and conservation priorities are well represented. As the Magnuson-Stevens Fisheries Conservation and Management Act reauthorization advances on Capitol Hill, Bass Pro Shops Founder Johnny Morris and Maverick Boats President Scott Deal, leaders in the recreational angling industry and co-chairmen of the Commission on Saltwater Recreational Fisheries Management, will present A Vision for Managing America’s Saltwater Recreational Fisheries at the National Press Club on March 26, 2014, from 9:30–10:30 a.m. 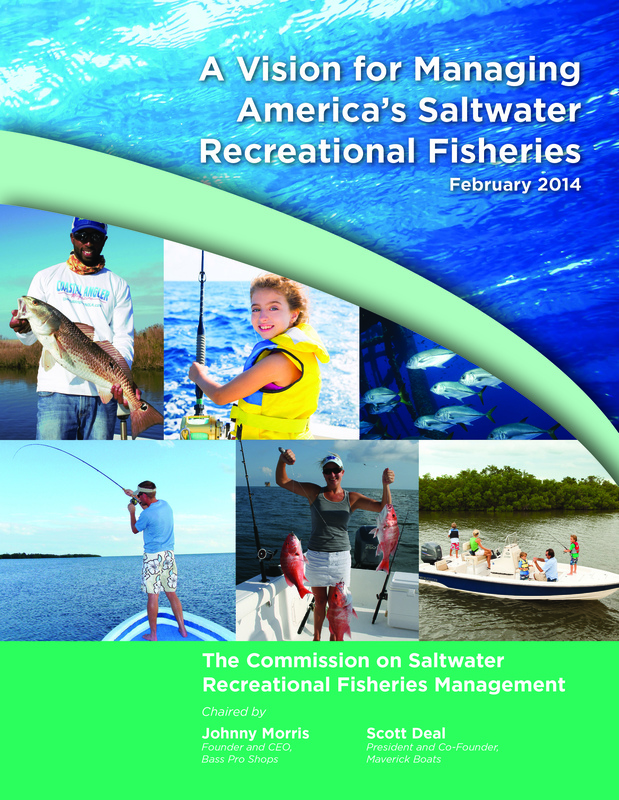 The report, introduced to fishing and boating industry stakeholders on Feb. 13, 2014, at the Progressive Miami International Boat Show, is receiving critical acclaim as an important step toward commonsense saltwater fisheries management. Now, with strong support from the boating and fishing community, the commission is taking the report to the Hill to work with Congress as the Magnuson-Stevens Act reauthorization proceeds. RSVP to Lauren Dunn, National Marine Manufacturers Association, at ldunn@nmma.org; or Mary Jane Williamson, American Sportfishing Association, at mjwilliamson@asafishing.org.